In our recent manuscript (https://www.biorxiv.org/content/10.1101/557082v1) we revisit promoter bivalency in naive mouse embryonic stem cells using multiplexed quantitative ChIP. Why doing multiplexed quantitative ChIP? Multiplexing speaks for itself – many experiments all in one tube. But let’s talk about the need for quantitative ChIP. Here is a boat with an observer. A volcano island rises high above sea level. Here is the boat again. For the observer, the peak now appears pretty small. But we as an outside observer can see that it is not the volcano height that changed, it is the sea level that rose up to the peak. Traditional ChIP normalisation assumes a constant background both on the technical and the biological level. Just like the observer in the boat who does not know the change in sea level, the method is blind to global alterations in histone modification levels. In our study, we find that our multiplexed ChIP operates on a ultra-low technical background and allows us to quantify the true distribution of histone H3K27me3 above the technical background. Strikingly, naive mouse ESC have twice as much H3K27me3 methylated nucleosomes as ESC in Serum, and the gained H3K27me3 modifications distributes broadly across the genome while traditional Polycomb targets, such as bivalent domains retain approximately equal levels. We are developing a chemical biology technique called amber suppression or unnatural amino acid mutagenesis in mammalian cells. Unnatural amino acids with a variety of chemical functionalities can be inserted site-specifically into a target protein within a living cells in response to a recoded stop codon. Such strategy for genetic code expansion holds great potential for engineering proteins in vivo, but its applicability to basic biology and human disease research has been hampered by the limited biological systems it could be established in. We have developed an optimized system that allows highly efficient amber suppression in mammalian cells (read more). Using this system, we aim to do biochemistry in a living cell, controlling and observing proteins ‘at work’ in their in vivo environment. Unnatural amino acids with useful chemical or physical properties can be incorporated site-specifically into expressed proteins. One strategy for unnatural amino acid incorporation via “genetic code expansion” is to convert an amber stop codon (UAG) into an elongation codon for an unnatural amino acid through the development and synthetic evolution of orthogonal aminoacyl-tRNA synthetase/tRNACUA pairs. Amber suppression has been achieved in select mammalian cell lines amenable to transient transfection or viral transduction. However, universal and efficient methods to perform amber suppression experiments in cell lines and primary cells are lacking. In particular, for applying unnatural amino acid mutagenesis to sensitive biological problems and phenotypic studies, it is essential to be able to characterize and dissect the phenotypic effect of the amber suppression machinery itself from the desired activity of the specific target protein. Furthermore, for studies that use large cell numbers, such as biochemical, (epi)genomics or transcriptomics analyses, it is important that single cells express the amber suppressed target protein in defined and uniform manner across the entire population. These aims have not been achieved with transient transfection or viral delivery methods. Thus it has been our goal to develop systems that can stably and robustly support unnatural amino acid incorporation in mammalian cells. We are spearheading a novel and robust strategy of generating stable cell lines for performing amber suppression developed in the Chin lab. We have shown that, using PiggyBac mediated genomic integration, the pyrrolysyl aminoacyl-tRNA synthetase/tRNACUA pair (PylS/PylT) can be expressed robustly in a range of human cell lines and mouse embryonic stem cells, allowing homogenous, controllable incorporation of an unnatural amino acid into a protein of interest. 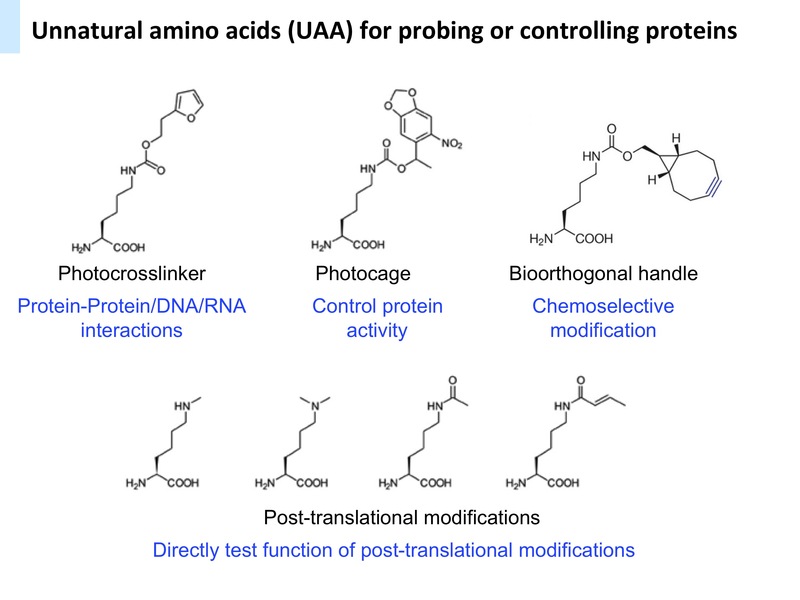 Originally applied to incorporating a modified lysine (acetyl-lysine) in our recent publication, we now use a wider range of unnatural amino acids to probe and control the function of proteins in living cells. Epigenetic states determine gene expression patterns during differentiation and organismal development. These heritable states are layered on top of the genetic information, which is the same in every cell irrespective of the differentiation program it follows. 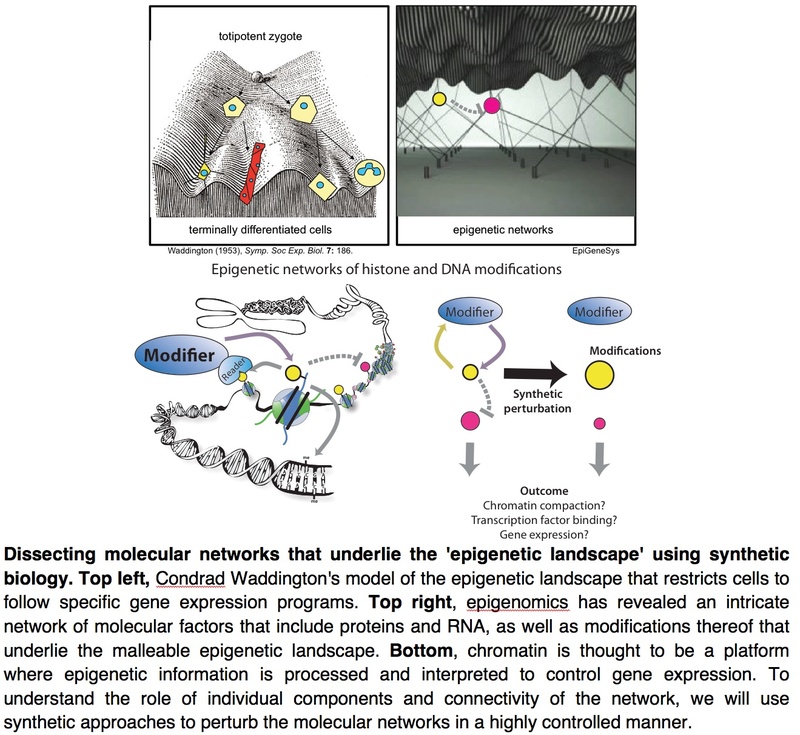 Epigenetic states are, while usually established by a DNA sequence-specific signal (such as the action of a transcription factor), maintained or propagated in the absence of DNA-sequence specific factors. The molecular basis of such cellular memory has remained elusive, yet histones, the proteins that package DNA into chromatin, have been recognized as a prime candidate for epigenetic regulation. The wealth of known histone posttranslational modifications (marks) and combinations thereof highlight the verbose coding potential of chromatin for epigenetic information. With the advent of epigenomics, histone modifications have been studies in many aspects of human disease – pre and postnatal development, behaviour, memory and neurodegeneration, genome stability and cancer, diabetes and cardiovascular diseases, AIDS, stem cells and reprogramming. However, it has been noted that our current, descriptive methodologies do not rule out the possibility that histones are mere bystanders rather than culprits in many pathologies. For example, it is disputed that histone marks, and ultimately the underlying histone moiety, have a long lifetime, and are inherited faithfully during DNA replication. In the absence of unequivocal proof of locus-specific histone inheritance, the epigenetic nature of their marks remains debatable. It is therefore a major challenge of our field to devise experiments that can directly and conclusively test this hypothesis. Gene expression plasticity is thought to be an essential feature of germ line and pluripotency. Yet, transcriptionally permissible chromatin poses a severe challenge for maintaining heterochromatin. ERVs and other interspersed repeats are particularly vulnerable to reactivation, as their integration sites are not part of large repressed domains (such as telomeric and centromeric heterochromatin). The repressed state of ERVs can be inherited across generations in mice despite global chromatin reorganization in the germline, underpinning the epigenetic basis of silencing . In mESC, the repressive histone mark H3K9me3, established by the methyltransferease SETDB1, is essential for ERV silencing. 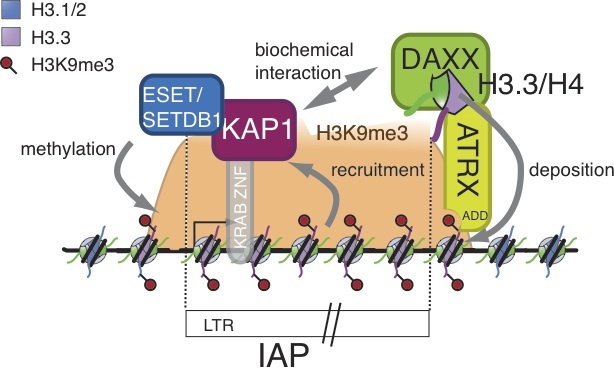 In addition, the corepressor KAP1 is required, orchestrating the silencing machinery around the characteristic long terminal repeats (LTRs) that are recognized by DNA-sequence specific transcription factors. We have recently uncovered a role for histone variant H3.3 amplifying H3K9me3-mediated silencing (read more). Intriguingly, in more differentiated cell types, such as neuronal precursors, DNA CpG methylation becomes necessary and sufficient for silencing. Thus, ERVs provide an ideal study system to dissect the dynamic interplay between DNA-sequence-dependent and epigenetic silencing pathways.